Celebrate the New Year by sampling the specialty dishes and wines of Northern Italy in the cozy Winter Kitchen. Events will be held in various indoor and outdoor locations throughout Shaker Village. Please follow on-site directional signage to event location and plan on checking-in 15 minutes prior to the event start time. Event tickets will not be mailed in advance. Every effort will be made to hold Fresh Food Adventures at scheduled outdoor locations. In case of inclement weather, events will be moved to an indoor location. Please consider the event location and season when planning your attire. ICI members, past and present, it’s time to renew your membership! Membership fees are due by the end of February of each year! The 2018 year was a fun and busy one offering seven major events and activities for you Italophiles to enjoy! There was Carnevale in February, three Italian films in April, “Italian for Travelers” for eight lessons in March and April, a grand dinner and scholarship fundraiser honoring Vincenzo and Agostino Gabriele at Sullivan University, and a delicious meal and presentation on soccer in Italy at ROC restaurant in October. Dr. Chris Fulton presented a fascinating art history lecture in November, and the year’s events were completed with a festive and delicious holiday dinner at Volare in December. The ICI is proud to offer annual scholarships to further students' studies and passion for Italian language and culture. This past year, the ICI—in partnership with the Italian-American Association of Louisville—was pleased to honor Vincenzo and Agostino Gabriele and their contributions to the rich Louisville culinary scene by awarding scholarships in their name to deserving culinary students from Sullivan University. Come join us on Sunday, January 13 at Fante's Coffee House on Grinstead Drive from 2:00-3:30 pm for presentations from last year's winners as well as coffee and dolce! Guests are welcome to purchase snacks and drinks from Fante's fantastic selection as you'd like. Students will share about their experiences studying with a culinary school in Florence and reflect on lessons learned during their time abroad. Additionally, Fante’s Coffe House owner, Leo Fante, will give a brief presentation about different coffee types and preparation methods. This event is free and open to the public, but we ask that you kindly RSVP below so that we can get an approximate headcount. In celebration of the holidays, the events committee invites all members, families, and friends of the Italian Cultural Institute to gather on Sunday, December 2 at 6:30pm for a joyous celebration of the season at Volare Italian Ristorante, located at 2300 Frankfort Avenue. We’ve had a fantastic year with a lot of fun events. We celebrated Italian film, food, soccer, literature, and—most importantly—two Italian chefs, Vincenzo and Agostino Gabriele. Our two scholarship winners, Sydnie Alexander and Jessica Marcano, will be presenting on their experiences at cooking school in Florence thanks to the scholarship awarded in honor of the Gabriele brothers. Guests will be treated to a four-course meal with delicious appetizers, a salad, entree, and dessert. Tickets are $74 per person and can be purchased through the ICI website. Ticket price also includes the cost of all drinks (coffee, tea, wine, soda), as well as gratuity and sales tax. Art History Lecture with Dr. Christopher Fulton - "Fire and Fury in Florence: The Story of Fra Girolamo Savonarola in Pictures"
Dr. Christopher Fulton, Associate Professor and Director of Graduate Studies in Art History at the University of Louisville, will deliver a presentation on “Fire and Fury in Florence: The Story of Fra Girolamo Savonarola in Pictures." Girolamo Savonarola, his story is still important today. Learn how the “Bonfire of the Vanities” speaks still to challenges calling for reformation of power centers. The lecture will take place on Wednesday, November 28, from 7-8 pm at the Chao Auditorium at the University of Louisville. Please RSVP below. The event is free and open to the public, and we would love to see attendance from the ICI community and students alike. Soccer is known worldwide as The Beautiful Game. Italy has a storied affection for the sport matched with a successful record of four World Cup titles in 1934, 1938, 1982, and 2006--the second most of any country. Though the team has faltered lately, the passion for "calicio" and the national team, "Gli Azzurri", has not been diminished. Come join the ICI for a special lecture on the role of soccer in Italian culture and society presented by Dr. Renato LaRocca, who grew up in Italy and can speak firsthand to the national pride, history, and identity captured by the sport. Dr. Ivan Ljubic will also provide comments speaking to a broader theme of soccer and national identity. Dr. Ljubic was in Croatia this summer when the Croatian national team made a historic run to the World Cup final. The event will be hosted at ROC (1327 Bardstown Road) on October 21 from 5:00 to 7:00 pm. Tickets are $5 with food available a la carte. Space is limited to the first 30 registrants, and tickets purchased for this summer's "Cheer Like An Italian" event will be honored. The Italian-American Association of Louisville would like to invite all of its members and their family and friends to enjoy an evening of exciting soccer while supporting Love the Hungry, Love the Hungry is a local 501(c)(3) organization that packs and ships nutrient-rich meals around the world to alleviate and reverse the effects of malnutrition in young children. Love the Hungry has partnered with Louisville City FC to hold the first-ever “Love the Hungry Night” on September 8 at 7:30 p.m., when the hometown team will take on its arch-rival FC Cincinnati. Tickets are $14, and a share of the proceeds from ticket sales will go to benefit the work of Love the Hungry. Please consider joining other IAA members by spending that Saturday night watching an exciting soccer match and benefitting a great cause. Go Louisville City FC! For more information, please contact Aaron Silletto, IAA coordinator for this event, at asilletto@goldbergsimpson.com. 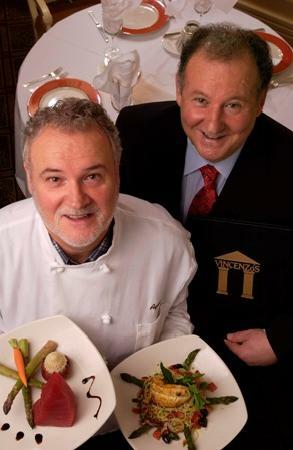 In recognition of Vincenzo and Agostino Gabriele and their storied legacy of mentorship and influence upon the Louisville culinary scene, we honor them, fittingly, with a dinner to toast to their legacy and support a scholarship fund to assist young chefs to train and study in Italy. Presented by Sullivan University, the Italian Cultural Institute of Louisville, and the Italian-American Association of Louisville, the dinner will feature five Italian wines and five courses, each prepared by a local chef whose career was shaped by the Gabriele brothers. The dinner will be held at the Sullivan University campus on May 22 from 5:30pm - 8:30pm. Tickets are $125 per person, and all proceeds will benefit scholarships at Sullivan University in the name of Vincenzo and Agostino to support young chefs as they study culinary arts in Italy. The event be held in the student cafeteria of Sullivan University at 3101 Bardstown Rd, Louisville, KY 40205. Entry to the event is through the administration building main entrance (please see map below). Please be courteous that classes are ongoing in other parts of the campus. Guests are invited to arrive around 5 pm to mingle before dinner. Upon arrival, guests are invited to check in at our registration desk. We did not mail physical copies of the tickets but rather will have your registration information on-hand. Table assignments will be posted for individuals to view and locate seating. Dinner will begin at 5:30 pm. We will host a special recognition ceremony for Vincenzo and Agostino Gabriele and will announce the scholarship recipients, who will partake in an intensive 10-day course at the Bivero Pizza Academy in Florence. Dinner will continue with five courses paired with five unique wines all prepared by esteemed local chefs. Dinner will last at until approximately 8:30 pm. Thank you for your interest! Due to overwhelming demand, we have sold all tickets. Individuals interested in making a donation to the scholarship fund are welcome to contribute, but event tickets are no longer being offered. Film directed by Emanuele Crialese. "A 2006 drama film based on a family's migration from Italy to New York City, U.S.A. at the beginning of the 20th century"
By popular demand, the ICI is pleased to offer Italian language lessons hosted by native Italian instructor Francesca Reggiani. Lessons will be held weekly in in March and April at Francesca's home. The course is $45 for ICI sponsors (members) and $65 for non-sponsors. Classes will run from March 4 - April 29 on Sunday afternoons from 2:00-3:30 pm (except for Easter). Interested in learning more? Join for our free information session and class meeting on Sunday, February 18 at Fante's Coffee (2501 Grinstead Drive) beginning at 3:00 pm. Come join the ICI for our annual Carnevale gathering at Hunting Creek Country Club on Thursday, February 8 from 6:00 pm - 9:00 pm. Guests will be treated to a buffet, raffle, and decorations recalling the mysterious beauty of the Venetian celebration. Enjoy a generous spread of pasta, wine, salad, and dessert. Tickets are $25. As always, guests are most welcome. The ICI is proud to offer annual scholarships to further students' studies and passion for Italian language and culture. Come join us on Sunday, January 28 at Fante's Coffee House on Grinstead Drive from 3:00-4:30 pm for presentations from last year's winners as well as coffee and dolce! Guests are welcome to purchase snacks and drinks from Fante's fantastic selection as you'd like. Students will share about their experiences with the Kentucky Institute for International Studies, Inc. (KIIS) Italy Program. In celebration of the holidays, the events committee invites all members, families, and friends of the Italian Cultural Institute to gather on Sunday, December 10 at 6:30pm for a joyous celebration of the season at the River House Restaurant, located at 3015 River Road near the Louisville Water Tower off Zorn Avenue. Once again, the celebration will be held in River House's private dining room. Guests will be treated to a four-course meal with delicious appetizers, a salad, entree, and dessert. As a sneak preview, entrees include chicken, salmon, beef, and shrimp options. For dessert, you can't go wrong with either the bourbon and white chocolate panettone or tiramisu. Tickets are $74 per person and can be purchased through the ICI website. Ticket price also includes the cost of all drinks (coffee, tea, wine, soda), as well as gratuity and sales tax. Please register for the event by December 10 to ensure your spot! See below for full menu details. While many of us dream of pressing pause on daily life and moving abroad to Italy, Nancy Wellendorff Church ACTUALLY seized the opportunity and took the plunge. She'll be sharing stories and lessons from her travels in the 'Bel Paese' during an upcoming lecture at the University of Louisville on Sunday, November 12 from 3:30-4:30pm in the Chao Auditorium of the Eckstrom Library of the University of Louisville. Registration is free and open to the public; no tickets are required. We encourage all ICI members to join for what should be a memorable event! As a preview of stories to come, check out some of Nancy's fun travel photos below. There will be a small reception outside the auditorium after the presentation. Sweets and treats are welcome! The Italian Cultural Institute of Louisville celebrated Italian culture with a fall harvest festival featuring a magnificent pig roast from Kingsley's under the shady canopy of Locust Grove on Sunday, September 3. Activities included Bocce and Buci di Mais (corn hole) competitions plus spirited accordion music. We also hosted a fun basket raffle with scrumptious prize offerings from Lotsa Pasta and other artisanal wine, cheese, and bread offerings from local vendors to benefit the scholarship fund. The Italian Cultural Institute of Louisville was pleased to offer the second of our three-part "How to Drink Like an Italian" series, this time focusing on aperitivi. This event took place on Saturday, July 8, from 3:00 to 4:30 pm at Cafe Classico (2144 Frankfort Avenue). Italians often get together before supper for a drink at the bar—typically one drink, not many—and appetizers. At this event, we drew upon this social custom by enjoying either an aperol spritz or a negroni, along with nice appetizers. We learned about these drinks and--as a bonus--learned the Italian national anthem together in preparation for Italy’s forthcoming victory in next year’s soccor World Cup. Each year, the Louisville Italian-American Association (IAA) supports the Kentucky Special Olympics (KSO) by sponsoring the “Lou Perry Bocce Tournament,” which is named in honor of longtime IAA board member Lou “Mr. Bocce” Perry. The IAA is seeking volunteers to serve as bocce referees on Saturday, June 3, 2017 for a tournament at the Special Olympics at Eastern Kentucky University. Volunteers do not need to be experienced bocce players. To help volunteers become familiar with the basic rules of bocce, the IAA will be scheduling a brief training session one evening prior to the event. In addition, to help cover the cost of travel, the IAA will be providing up to $100.00 per car traveling to Eastern Kentucky University. If you are interested in serving as a volunteer, please see the details of the event presented below. Join the ICI for a lovely evening of pizza and Sicilian travel tips hosted at Coals Artisan Pizza on Frankfort Avenue. Guests are welcome to choose from Coals' full menu of artisan pizzas, beer, and wine. We are collecting $5 for admission, which will be applied towards next year's scholarship fund. Guests will cover food and drinks separately. We're pleased to welcome certified travel agent Jo Rouse to speak to our group about traveling through Sicily. Jo frequently visits Sicily and is well-versed in the best sights to see and navigating the island. Attendance is limited to the first 30 guests. Please register online through the form below. Note: this is the St. Matthews Coals location in the old Vogue theater complex. We've reserved space in the private, upstairs seating location. THIS EVENT IS AT CAPACITY. PLEASE CONTACT ICI.LOUISVILLEKY@GMAIL.COM REGARDING POTENTIAL AVAILABILITY FOR DAY-OF TICKETS. This lecture explores the achievement, influence and reputation of Michelangelo Buonarroti, who was called in his day "il divino"—the divine one—for his apparently superhuman capabilities. What is the reality, and what is the myth, behind this giant figure in the history of art? "Cose dell' altro mondo" (Things from another World) (2011): Directed by Francesco Patierno. Set in the northeast of Italy, rather well off but reliant on immigrant work. A racist and hypocritical industrialist goes into daily rants on a local TV against immigrants, legal or illegal. Until one day they all disappear. "Terraferma" (2012): Directed by Emanuele Crialese. Two women, one a local and the other an immigrant from North Africa, sharing the same dream: a better future for their children. 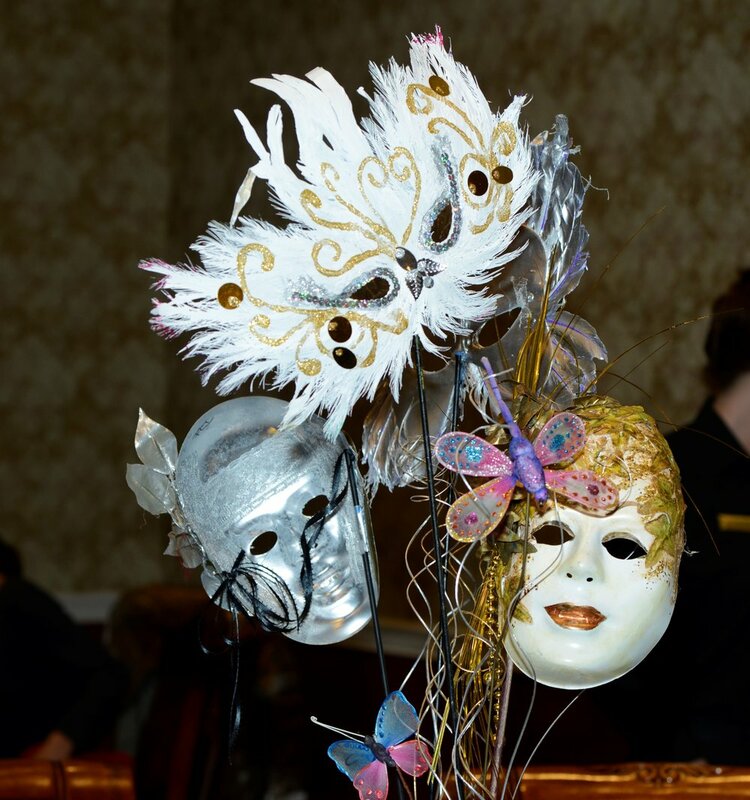 The ICI welcomed 40 guests for a rousing celebration of Carnevale at Hunting Creek Country Club. The atmosphere recalled scenes of Carnevale in Venice thanks to video projections adorning the walls courtesy of Charles Wallace. Likewise, attendees enjoyed an excellent spread with fantastic desserts, pasta, salad, and wine--of course. Many thanks to Ros and Sal Vicario for all of their hard work organizing the event and dedication to the ICI!